AACC Was a Blast! Thanks Everyone! Have to start first by giving props to all the volunteers, MoCA staff, panelists, artists and visitors to the show. It would not have been as great as it was if it weren’t for any of you. Thanks! From what I hear, a good time was had by all at the Asian American ComiCon. I wouldn’t know since I was running around all day. When I did get a chance to sneak into a panel room, I saw SRO crowds and really interesting panelists having a good time together. Artists’ Alley seemed like it had a good vibe and looked like it had a nice flow of traffic. Not sure what the final tally was at the silent auction, but there were a bunch of knockout pieces donated that fetched some good prices–with all proceeds going back to the Museum. A more thorough recap is forthcoming (with photos!). Until then, check out Jerry’s AACC recap at his blog. 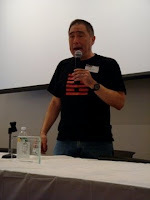 I think Larry Hama summed it up best during his Kiyama Award acceptance speech when he talked about the importance of “community.” Whether it’s the Asian American community or the community of comic creators and fans, without a community, we are nothing. And ultimately, that’s what the AACC was all about, celebrating the vibrancy of our community. Hey everyone. It’s been awhile since I last posted anything. As most of you hopefully know, I’ll be taking part at the AACC on July 11 along with a lot of other Secret Identities contributors. Anyway, I was asked to donate a drawing to the show, which will hopefully help raise some money for the museum itself. So I first did a drawing of Bruce Lee…and it really just didn’t come out too well. I mean…maybe it’s because I’ve just drawn the guy too much these past few months or something. So I decided to draw The Monkey King instead. Who…was just one of my favorite characters growing up. Anyway…here are both drawings. Hope everybody likes the Monkey King…and come to the show next week! Hope to see you guys all there.